Both companies face significant challenges, but one looks to have a better chance for long-term success. Both Frontier Communications (NASDAQ:FTR) and Sprint (NYSE:S) have dealt with their fair share of problems in the past few quarters. Frontier has been steadily shedding the customers it paid Verizon (NYSE:VZ) $10.54 billion to acquire in California, Texas, and Florida (CTF). Since completing that purchase, the cable and internet company has had three quarters where it reported losses not just in cable customers (which would match industry trends) but also in broadband (where its rivals have been gaining). Sprint has not had the same steadily downward trajectory -- it gained customers in its most-recently reported quarter -- but it has fallen into fourth place among the four major wireless carriers. The company has struggled to find an identity or a marketing strategy, and it has been greatly overshadowed by T-Mobile (NASDAQ:TMUS), which has positioned itself as the consumer-friendly wireless company. These are, as you can see on the chart below, two stocks going in opposite directions. Shareholders clearly like some of what Sprint CEO Marcelo Claure has done, while investors have not liked Frontier CEO Daniel McCarthy's quarterly promises that the customer base will stabilize only for it to keep dropping. 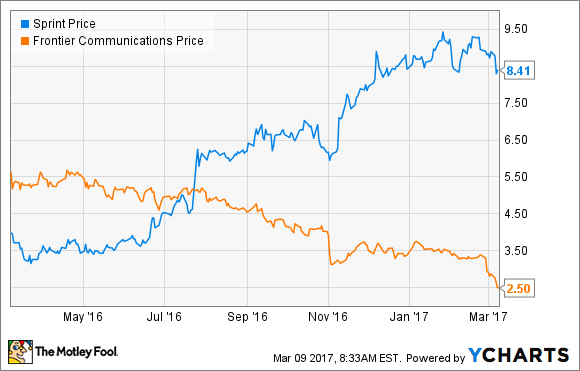 Sprint has the needle pointing up, while Frontier does not, but both companies have growth potential. Frontier, in fact, may even have a very simple path to a stock price turnaround. Frontier has seen subscriber drops in each of the last three quarters. In Q4, the company lost 144,000 residential customers. It also saw 14,000 business customers leave, and average revenue per user (ARPU) fell in both categories. McCarthy has attempted to explain that away, saying in Q2 and Q3 that the declines were due to problems related to the cutover, then saying in Q4 that the drops were due to a one-time problem with non-paying customers. The CEO has also been relentless in explaining why, aside from the subscribe loss issue, Frontier has been meeting its goals. "During the quarter we made significant progress in positioning our company to deliver a better customer experience and improved financial performance, with greater financial flexibility," he said in the Q4 earnings release. "We now expect annualized cost synergies of $1.6 billion to be achieved by mid-year 2018, up from the $1.4 billion target outlined in the 2016 third quarter earnings report, and a full year earlier than anticipated." Frontier has largely achieved the synergies it said it would from buying the CTF properties. If it can stabilize and eventually grow its subscriber base, not only will its share price grow, but its attractiveness as an acquisition target will improve. Sprint has been using Verizon's former "Can You Hear Me Now" guy in its ads. Image source: Sprint. While the company has faltered in recent years, it seems to be moving in the right direction now. Sprint added 368,000 net postpaid subscribers in Q4, its highest total in four years, according to the company. The wireless carrier also has nine straight quarters of growth in that metric, and it has grown revenue for two straight quarters. The negative, and it's a big one, is that the company had a net loss of $479 million in Q3. However, the company has cut annual expenses by $1.6 billion year to date, and it has also seen its scores rise on the well-regarded RootMetrics wireless network quality report for the second half of 2016. Even with all the aggressive promotional offers from our competitors, we were still able to add more postpaid phone customers than both Verizon and AT&T while continuing to grow revenues, take costs out of the business, and improve the network. Sprint has performed admirably, but some of that success has been priced into its stock price. Conversely, Frontier has underperformed, and its shares have tanked accordingly. Going forward, Sprint faces a tougher path. It's not the innovator in its space -- that's T-Mobile -- nor is it the company with the best network (that's Verizon, according to RootMetrics, with T-Mobile tying for first in another leading study). In some cases, Sprint is the cheapest, and that has helped its growth, but there are obvious drawbacks to the strategy of lowering prices to get customers when after the low-cost deal expires, it's relatively easy for them to leave. Both of these companies face tough roads in competitive markets. However, Sprint has already begun its recovery, and it's more likely to hit roadblocks than it is to go steadily upward. Frontier is currently a bargain as long as you believe McCarthy when he says the company will reverse its subscriber losses. If the company can do that when it reports on Q1 in roughly three months, it should see a decent uptick, making it the better buy.